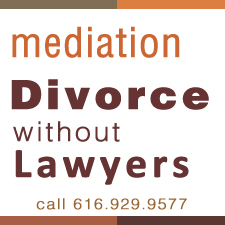 In the Grand Rapids metro area there are many qualified mediators who can handle your issues. Call me first because with over thirty years of divorce experience you can consider me a “triage nurse”. I can handle your litigation but that is not what makes me different. I am different because I will explain the process to you, and help you decide if you need other lawyers and I will find you competent counsel in the area you need. My situation is different because I do not take every case and I do not need to support a large office overhead. I am happy to just talk, and help you navigate this mine field.